The term ‘Global South’ is en vogue and ubiquitous in scientific studies and publications. Its increased popularity since the 2000s is reflected in its common use in book titles or names of research institutions. Only a limited number of scholarly analyses and reflections are devoted to furthering the theoretical discussion and development of the concept ‘Global South’ at present however. Critics point out that the 'Global South' merely replaces concepts such as ‘Third World’ and ‘South’ and that it is often used uncritically and as a (supposedly) politically correct substitute of those terms. In the workshop ‘Conceptual (Re)Locations of the Global South’ the Global South will be analyzed and conceptualized as a discursive and performative social construction, which is (re)created through for example socio-cultural, visual and material performances and representations. 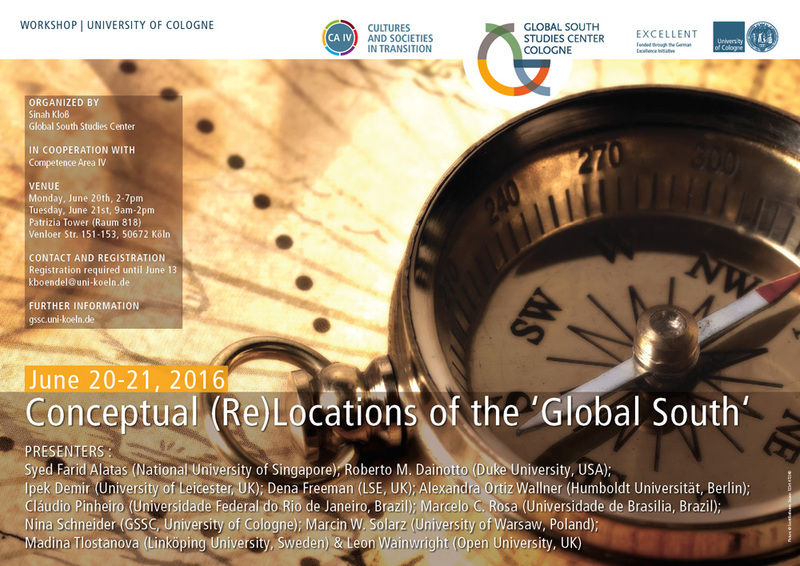 Actor-related perspectives and analyses will be examined and discussed in this two-day international workshop, allowing the further refinement, systematization and theorization of the concept ‘Global South’ across disciplinary boundaries.